Andritz will display its innovative nonwoven productions and textile solutions at Techtextil 2019 exhibition, in hall 3, booth B15. The international trade fair for technical textiles and nonwovens will be held from May 14-17, 2019, in Germany. Andritz is a technology group providing plants, systems, equipment, and services for various industries. The long tradition of excellent calender technology for the textile industry is now continued with the teXcal Raconip TT calender. The teXcal Raconip TT mainly targets customers experienced in the manufacture of technical textiles with highest quality standards, for example, sports and work wear, sailcloth, parachute fabrics, or packaging materials, the company said in a press release. The company will also introduce visitors to the processing of glass fibres with wetlaid technology. Nonwoven end products based on glass fibres can be found almost everywhere: in ceiling tiles, cushion vinyl flooring, insulation, wallpaper and surfaces, geotextiles, batteries, roofing materials, as well as other applications. Glass fibre as a basic component is an excellent composite material and offers numerous advantages that lend the resulting products unique properties. And because of its wide range of applications, products made of glass fibre material have a strong, growing market. The manufacture of products based on glass fibres requires particularly gentle treatment in the stock preparation and laying processes. Andritz meets these requirements perfectly. At Techtextil, Andritz Wetlaid experts will present details of this new configuration to interested visitors for the first time. 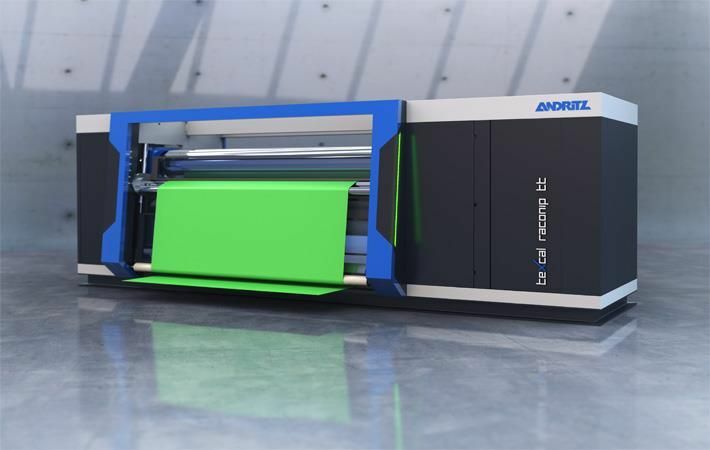 Another focus of Andritz at Techtextil 2019 is its needle-punch technology, which the company has been supplying successfully for many years to a variety of industries such as geotextiles, roofing materials, filtration, technical felts, carpeting, and many more. One of Andritz’s main areas of needlepunch excellence is the needlelooming process, which gives the material the decisive properties for consistently high quality. Andritz needlelooms include pre-needling units as well as standard needlelooms and, above all, specialised needlelooms that can be fully adapted to the customers’ needs.